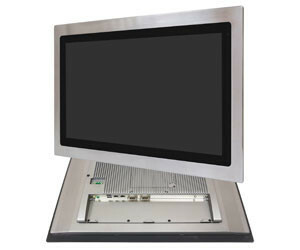 Interworld Electronics has released the FABS-915AP food-grade stainless steel panel computer. It is housed in a fanless aluminium enclosure with a 304 or optional 316 grade stainless steel bezel that provides IP66/IP69K front panel protection. Part of the FABS Series, the FABS-915AP has been optimised to meet the hygienic design requirements of DIN EN 1672-2 and DIN 42115, Part 2. These European standards establish high standards for the food and beverage processing equipment. The panel PC is powered by an Intel 6th/7th generation Core I processor with DDR4 memory. The 15″ 1024x768 resolution LCD and 7H anti-scratch highly durable projected capacitive touch screen make it suitable for operator panel and HMI control applications. The standard 420 cd/m2 or an optional 1000 cd/m2 high brightness screen is available. The FABS-915AP provides: 2 x COM, 2 x GbE LAN ports, 2 x USB3.0 ports as well as support for internal Mini-PCIe expansion modules. Communication and network options include 3G/4G, Wifi/BT, GPS and RFID. The internal 2.5″ SATA3 HDD is easy to access allowing the operating system and data storage to be upgraded at any time. It supports DC 9~36 V power input and an operating temperature range of 0~50°C. Operating system support includes Windows 10/IoT. The FABS-915AP is only 54 mm deep. Panel and VESA mounting makes the FAB series convenient to install. 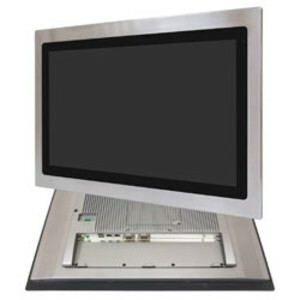 I am interested in FABS-915AP Food-Grade Stainless Steel Panel PC .